VOODOO! What could anyone ever do to deserve this? His body, rigid and turned upside down. His head, a crab. Points for originality, though. There's so much more you can do with your voodoo doll instead of sticking yet more pins into it. Use your imagination! Remember the Commensal Hydroid that grew all over a snail's shell until it looked like a monkey suit? 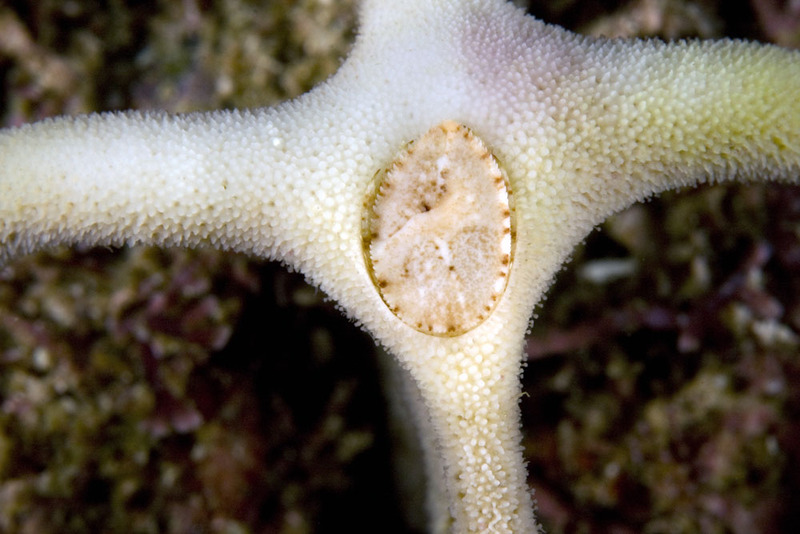 Well here's the more virulent version, the Staghorn Hydrocoral (Janaria mirabilis). It latches onto all sorts of snail shells on the coast between California and Panama and then grows and grows and grows. And once the snail's shell is completely covered and encrusted by the hydroid colony, it just keeps going. 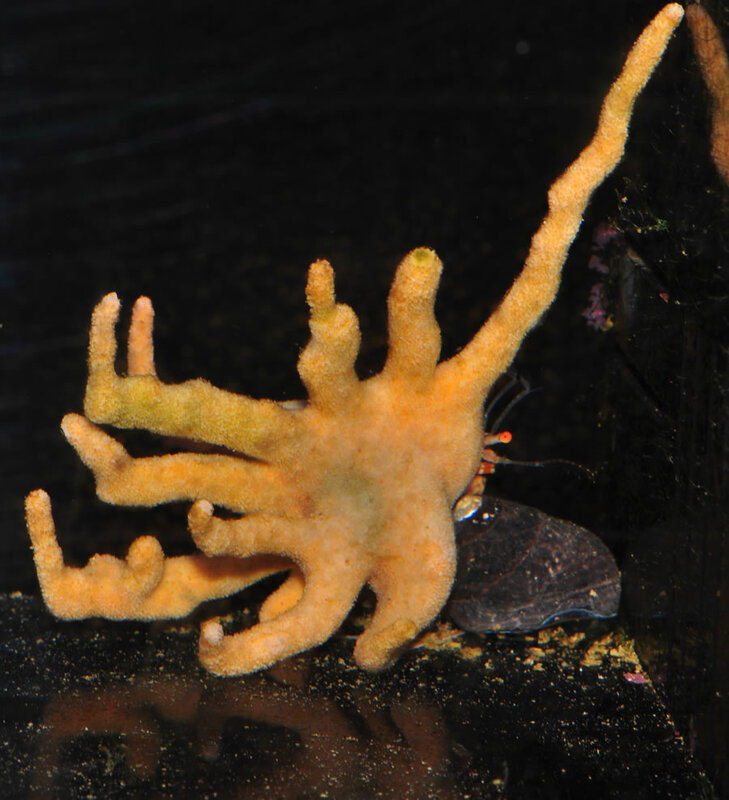 Staghorn Hydrocorals are almost always seen with their very own Staghorn Hermit Crab (Manucomplanus varians). Hermit Crabs are those soft-bodied crustaceans who famously carry around a snail's shell for protection. The Staghorn Hermit has traded the elegant whorls of the snail for the knobbly swellings and malformed spires of an imposter. There it sits, happily picking at detritus to feed while its back end looks like it got consumed by a cordyceps fungus. They can even retreat further into their living shell and shut the entrance with an enlarged claw. It's adorable, in a way. 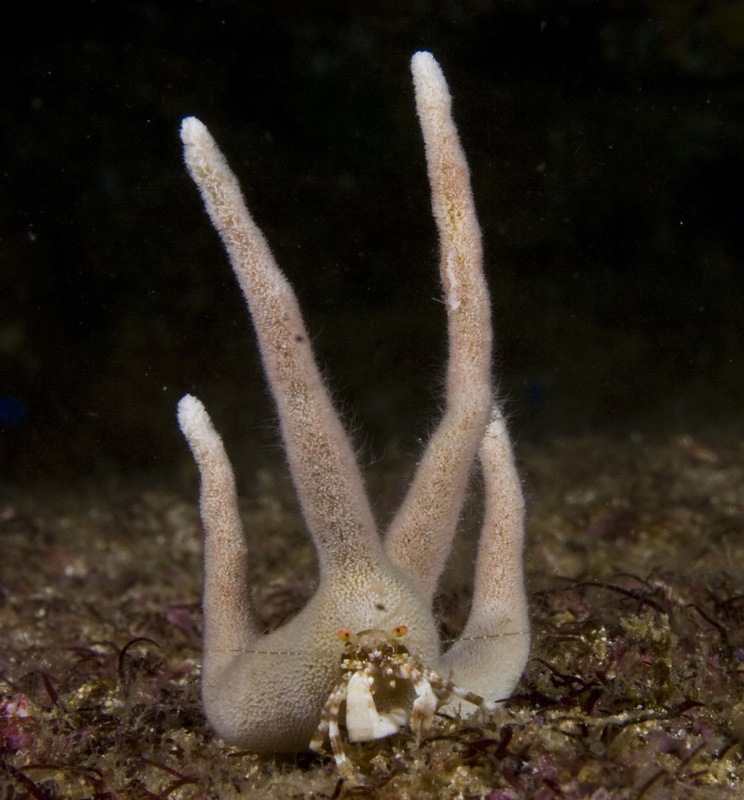 The Staghorn Hydroid goes to all that effort physically replacing a snail's shell and the Staghorn Hermit Crab gets a rather awkward-looking house to lug around, but at least they have each other. There's a bonus to having a living shell: Natural Camouflage! well, i'll go with your version that the snail is already dead. @Porakiya Draekojin: Very true! I love flamboyant, counter-intuituve camouflage! @TexWisGirl: Yes! Let's make the world a better place! @Lear's Fool: True! Or maybe two of them so they could disagree about where to go like that two-headed monster in Sesame Street. @Crunchy: Ha! There's always one!